Sveti Vlas (also known as St. Vlas) is a beautiful coastal village of approx. 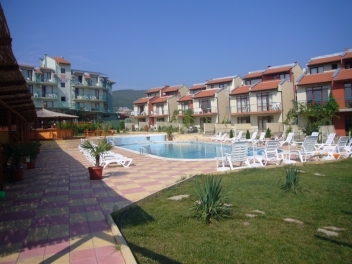 3000 inhabitants, situated just 5 kilometers north of Sunny Beach and 9 kilometers from Nessebar. This magnificent resort is a great combination of beautiful seaside at the foot of the Balkan mountain range. It has been developed into a modern beach destination during the recent years, with brand new hotels and tourist infrastructure. This makes it a preferred destination for holidaymakers, who want to enjoy the spectacular views of the mountain while having fun on the beach. The natural conditions- mountain, forest, sea and southern exposure of the mountain slopes, are extremely healthy and appropriate for a full relaxation. The beaches at st Vlas are three with a total length of 1, 5 kilometers- the central beach is the longest one, south of it is the small Campingi beach and the third one is the beach nearby the new yacht port Marina. Sveti Vlas is a sprawling local village whose spruced-up environs attest to lucrative spill-over business from Sunny Beach. Private enterprise is in full swing with a rash of spiffy-looking small hotels, new holiday apartments, holiday villas and restaurants springing up all over town. From your first view of the breathtaking panorama at our Vista Bar you will be enchanted by the beauty that is Garden of Eden. Our exclusive seafront resort, with five-star hotel and luxury apartments, has its own south-facing beach and pier looking across the beautiful blue waters of the Black Sea to Nessebar. Just outside St Vlas, close to Sunny Beach and within easy reach of Bourgas Airport, we offer the visitor a tranquil haven bordered by forests and natural parkland. Seven outdoor swimming pools and water cascades are set in landscaped gardens. Three restaurants cater for every taste. For active holidaymakers there are tennis courts and an indoor pool, fitness and spa centre. 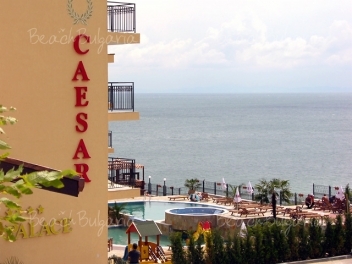 Caesar palace is situated very close to Sunny Beach, between St. Vlas and Elenite resort, on the front line, next to the nice sandy beach. Accommodation: Caesar Palace offers 16 two-bedroom and 36 one-bedroom apartments, 9 studios, 25 double rooms and 3 two-level apartments. 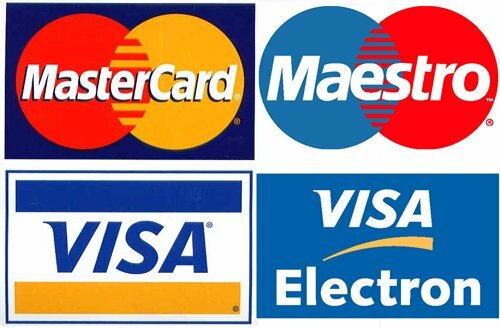 All of them are fully furnished and equipped to the highest standards. 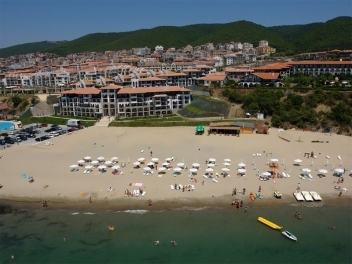 The pearl of Dinevi Resort is located on the front line in St.Vlas and offers a unique panoramic view over the entire sea bay. The apartments are spacious, with verandas facing the sea and overlooking one of the two crystal clear swimming pools with aqua bars, surrounded by greenery. 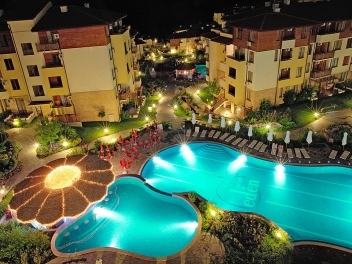 The YALTA RESORT-VILLAGE is placed right next to the sea, on the scenery soudh slope on the bay of the road to Sunny Beach.The village consist of 35 two-floor massive villas and a seafood restaurant in a Bulgarian retro stile. Functionally designet as small apartaments of 54 m on each floor. 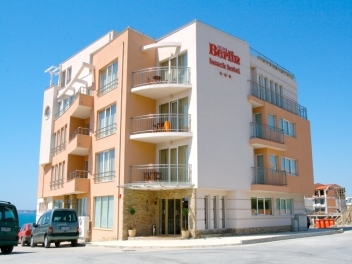 Berlin Beach Hotel is situated in st. Vlas, 5 km away from Sunny Beach, in the begining of the central beach and 500 m away from the "Marina Dinevi" yacht port. It is a four-storeyed hotel with a lift. 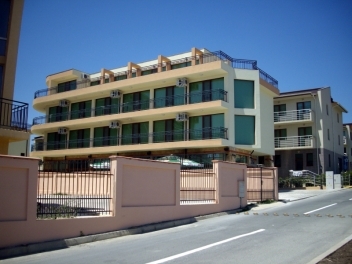 The Sunrise is an excellent hotel comprising of two buildings just 250meters away from the beach and with a good range of St.Vlas village. 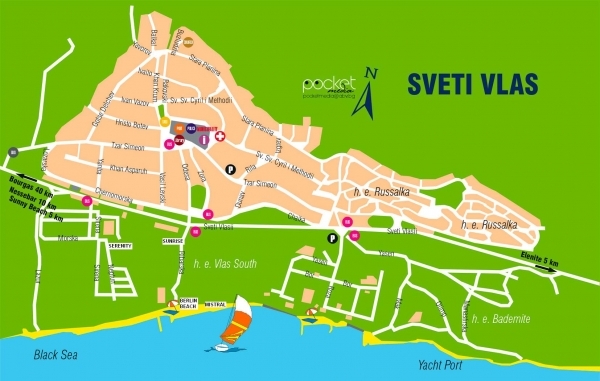 It is less than 4km from the centre of the Sunny Beach resort and in the same time is situated in quiet and calm area, famous with its healthy and mild climate. The Sunrise is a superb choice for families and groups of friends looking for a relaxing summer holiday in luxurious surroundings.